A bounty of artworks has landed here at the Museum of Fine Arts: "Two Centuries of American Still-Life Painting: The Frank and Michelle Hevrdejs Collection" is the recently announced gift of a local private-equity maven and his wife. It showcases canvases created between 1817 and 2014 by 60 artists, from James Peale (1749-1831) to Sarah K. Lamb (b. 1971). With pictures of fruits, flowers, game birds, pottery, books, musical scores, shells and one gun, the collection aspires to survey, in a single genre, all of American art history, from colonial realism through 19th-century trompe l'oeil, Impressionism, modernism, abstraction and pop to contemporary realism. I t's a Texas-size goal. And if the exhibition doesn't quite attain it, well, it does succeed on other levels. For one, that private collectors have amassed such a wide range of American still lifes at all is a "unique" feat, writes renowned scholar William H. Gerdts, himself a collector of the genre, in the catalog. It's fair to say that even after the academies, which ranked still life at the bottom of artistic achievement, lost sway, the genre rarely engendered widespread public excitement. One exception occurred in the 17th-century Netherlands, and it was those glorious Dutch "Golden Age" still lifes that charmed Mr. Hevrdejs as a youngster. When he began to buy art more than 30 years ago, he purchased some landscapes and figurative works, but he focused on American still lifes. Aside from their beauty, he recognized their capacity to convey wit, encoded commentary, investigations of nature, a sense of intimacy and technical brilliance. 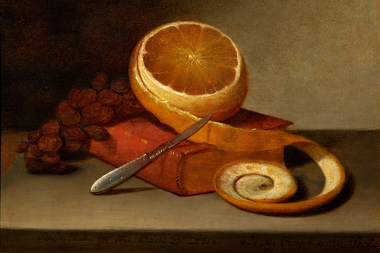 There are multiple opportunities to observe those characteristics here, starting with "Orange and Book" (c. 1817) by the father of American still-life paintings, Raphaelle Peale (above left). It is full of clues. He rarely painted books, so does this one—"A Book of Common Prayer"—refer to the work's patron, a minister? Do the grapes, also a Peale rarity, allude to the blood of Christ? Compositionally, the round of the orange is mirrored by the tail end of its curled peel—a play on the artist's name? Remember that peel in the last gallery, where hangs Scott Fraser's "Lemon, Lemon" (2014), a fanciful, funny portrayal of two half-peeled bright yellow fruits perched on ledges against a black background. The peels unspool to an impossible length, reminiscent of Rapunzel's hair—in homage to or in mockery of his predecessors? Maybe both. As befits a survey, the exhibition displays works by many members of the American art canon. Among the stellar ones are "Cherokee Roses" (probably late 1880s) by Martin Johnson Heade; "A Bachelor's Friend" (1891) by William Michael Harnett; "From Pink Shell" (1931) by Georgia O'Keeffe; "Rope and Shells" (1936) by Marsden Hartley and "Christina's Teapot" (1968) by Andrew Wyeth. But every good show should also offer revelations, and this one certainly does. To name just three: Thomas H. Hope's "My Companions" (c. 1890) is centered on a graceful Italian mandolin that sits atop an open musical score, next to an open book and before a gleaming floral vase that echoes its shape. Levi Wells Prentice's "Peaches in a Tin Bowl" (estimated mid 1880s-early 1890s) presents a bevy of ripe fruits, doubly reflected on the side of the bowl and a shiny tabletop. And Blanche Lazzell's strong cubist composition, "Shell & Jug" (1930), opens a window on her personal world. In the end, though, it's too difficult for a mere 67 paintings to tell the story of American art. 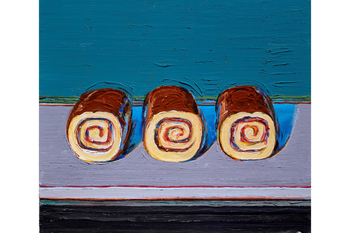 Pop is represented by just one piece, Wayne Thiebaud's "Jelly Rolls (for Morton)" (2008) (below left). And there is only one abstraction—or two, if you count Donald Sultan's minimalist "Rouge Poppies" (2012), which despite the intended focus on shapes is a hybrid, not a true abstraction. The biggest stretch comes in the Impressionist section. There, only a few of many works—notably John Henry Twachtman's "Apples and Grapes" (c. 1888-89), dramatic fruits against a stark white background, and Jonas Lie's colorful "Autumn Still Life" (1919)—are true examples of the genre. But, noting that few American Impressionists "favored the still-life genre exclusively," the exhibition offers paintings like Richard Edward Miller's "The Scarlet Necklace" (c. 1914) with "still-life details." Miller's work, which depicts a beautiful woman at her dressing table, does have a small pot of flowers, but Louis Ritman's garden scene, "Honey Bee's Paradise" (c. 1914), seems particularly out of place. And William Merritt Chase—a master of still life, famed especially for his shimmering depictions of dead fish—is here only with "The Japanese Book" (c. 1900), a portrait of his daughter in a kimono, a book unfurling from her right hand. That's the "still life." But the Hevrdejses continue to buy, filling in the lacunae and, perhaps, upgrading some of their lesser works. This bounty will grow, and the public will gain.